Get your walking shoes on and hit the track in the Aussie Outback. Discover a contrasting landscape of snaking river against the rugged water-sculpted granite at Auburn River National Park. Not for the faint hearted, this rough landscape provides many walks, the Riverbed and Rock Pools Walk, the most challenging of all. This walk travels the edge of the river through dry rainforest, eucalyptus forest and creek vegetation, with a refreshing swim your reward at the end. Distance: 1.5km return. Allow 1hr. Take an easy stroll along the top of the gorge through open rainforest and be rewarded with winding views down river – best seen after heavy rain. A sandstone wilderness with stunning backdrops, Cania Gorge National Park makes for a pleasant all-day weekend hike. If you're looking for stunning views than you can't go past Castle Mountain Lookout. A 22km return track offering breathtaking (if you even have any breath left after the hike) views of Lake Cania. Alternatively, take the kids for a picnic just a short walk along Three Moon Creek with ample opportunity to spot some wildlife and admire the sandstone cliffs. Atop an extinct volcano lies two large craters which form shallow lakes throughout the year. The Coalstoun Lakes walking track is the perfect track for those who have 'get fit' on their resolutions list this year. Walk up the northern side of the crater and be rewarded with stunning crater views and the pleasant surrounding rural landscape. 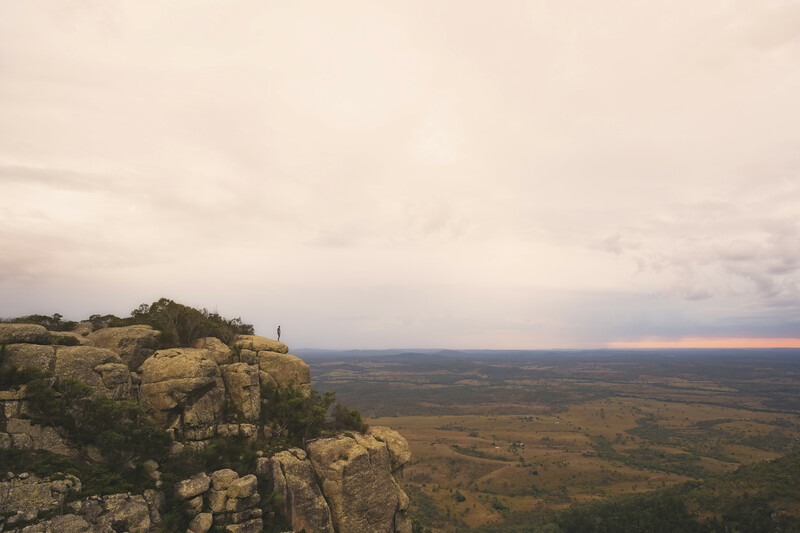 The most popular and well-known National Park in the North Burnett, Mount Walsh offers towering views of the North Burnett region. If you're looking for something for younger kids, or just not up to the 5-hour hike to the summit, try the Rock Pool Walk. A pleasant moderate grade walk to the rock pools through hoop pine rainforest and grassy woodlands leads to shady picnic spots and a series of refreshing rock pools. The Bluff Walking Track is a short 3km return track but expect a 5-hour trip due to the steepness. A challenging and fitness-testing track through hoop pine, eucalyptus forest to stunning tree-lined views of the surrounding countryside.